Ah, 3D printing. Is there anything you can't do? 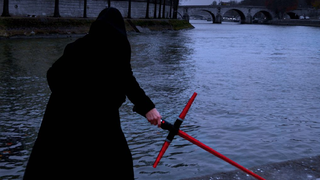 Not content with just bringing The Force Awakens' new Droid to the real world, people are also turning to 3D printing to give us our very own Crossguard Lightsabers - and they extend just like the Lightsaber toys do! The fine folks over at le FabShop, inspired by the frenzy and memes that the unconventional Lightsaber's appearance generated in the wake of the Teaser Trailer, decided to build one of their own to see if it would work in a similar fashion the the 'extending' plastic lightsaber toys we usually get with Star Wars merchandise. As you can see, it actually works pretty well - although I bet it might be a bit unwieldy in a fake lightsaber fight. But it looks like the design of the inevitable toy version is sorted for Disney already! Want instructions to make one yourself? Check them out over on Instructables.